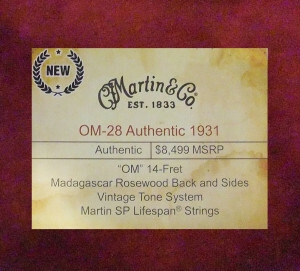 With all the projection and string-to-string balance heard from the legendary first modern acoustic guitar, Martin has resurrected their original Orchestra Model in the OM-28 Authentic 1931 – the most anticipated addition to the Authentic series in many years. Martin’s historically accurate Vintage Gloss Finish makes its first appearance on this new OM-28 Authentic, and heard for the first time is a refined version of their Vintage Tone System of wood torrefaction, reserved exclusively for the Authentic series of vintage Martin reproductions. Specs include: Construction of all solid wood, sanded to vintage thickness, with hide glue throughout; Auditorium body size; Madagascar rosewood back and sides; Martin Vintage Tone System torrefied Adirondack spruce top; torrefied Adirondack spruce bracing with 1/4″ tone bars and a 5/16″ X-brace; torrefied maple bridge plate; long-scale, one-piece mahogany neck with low vintage V profile unique to the OM-28 Authentic 1931; ebony neck rod; ebony fingerboard with 1-3/4″ width at nut, 2-1/4″ at 12th fret, Ebony ’30s style belly bridge with 2-5/16″ string spacing; bone nut and saddle; vintage Style 28 appointments with wood fiber inlaid 1931 rosette, fine herringbone top trim, short pattern diamonds and squares abalone fingerboard markers, grained ivoroid body binding; thin, hand-sprayed Vintage Gloss Finish; Waverly open back tuners. Note: this model may be ordered with traditional bar frets. With its distinct bass notes and solid perky trebles, each arm and arm with a firm, forthright midrange, suspended across a lucent undertone of Madagascar rosewood that fattens up the precisely defined fundamentals, and reflects the twinkling harmonic chimes of torrefied Adirondack spruce, it is clear from the first strum that this is an outstanding handcrafted guitar. It needs no allusions to legendary prewar Martins or comparisons to boutique fingerstyle guitars from the indie luthiers. But tis the fate of this OM-28 Authentic 1931 that it receives such scrutiny, given the status of the guitars it is attempting to emulate. The Martin OM-28 was the first 14-fret flattop 6-string acoustic guitar. Conceived from the ground up for steel strings, it introduced to the world one of the most copied designs in guitar history. Offered along with the mahogany OM-18 and pearl-trimmed rosewood OM-45, the OM-28 was available for sale only in the first four years of the 1930s, before being renamed and altered in significant ways. Frankly, no one familiar with prewar Martins is going to pick up an OM-28 Authentic 1931 and mistake it for an actual 1930s OM. But many will be delighted in how much like a prewar OM it is. While it feels, looks, and plays very much like the real McCoy, there are some differences that set it apart, in the way it was made and how it sounds. That being said, when compared to other modern guitars, the Authentic’s voice and personality have a great deal in common with its namesake – more so than any modern OM built thus far. As I tried to identify and decipher the intangibles that separated this replica from the genuine article, I was won over by the many qualities reminiscent of a prewar OM-28, in its voice, feel, weight, dynamics and playability, beyond anything Martin has produced to date. I approved of how it responded at every level of attack, and how it felt in the hands, both in terms of the tactile experience of holding it, and how the strings pull and release, as well as the clarity of the notes and how they pop out, yet stay connected to the resonant undertone glowing behind them. Even though this OM requires little effort to reach the “sweet spot” of optimum resonance with minimal resistance, this is not a frail instrument. Unlike other lightly-built guitars, I never felt restricted or forced into restraining my playing. In fact, it flourished with a certain amount of extra string tension from the fingertips. It was like it said, “Oh yeah. That’s the stuff!” when I would increase the pull on the strings, so it could convert more potential energy into kinetic energy, and ultimately full, unbridled tone. That was but one of the subtler prewar Martin traits to be found in this new OM-28 Authentic 1931. There is that almost spooky effortless projection, so that a listener ten feet away hears it as loud and intimate as if they were sitting next to the guitarist. There is the famous string to string balance. Just when my ear expects the midrange to drop into a trough, it remains buoyed and alert, very much in line with the bass and treble as an arpeggio sweeps across the strings. Those qualities should be heard from most well-made OMs. But here, they are just so much like the old timers it brought a smile to my face. The low E string and A string work together like twin pistons of equal force during alternating thumb-picking, where most modern OMs have a harmonically dominant A string and an E string that never projects as much as I would like – as much as it does on a vintage Martin. In general, when compared to other incarnations of the OM-28 available today, few have the same kind of vintage vibe going on when the strings sing and the soundboard starts to dance. Here is the quick, popping bark from the top notes as the wound strings are percussed with a pick or snapped with the fingers. And here is a certain clarifying ring in the highest timbres not unlike an old guitar – crisp and chimey. Similarly, a sort of dried out, old wooden box sound permeates the voice, quickly reflecting those top notes, with a quivering candescence under the trebles, and a diffuse, warmer presence spreading out under the lower registers – more open and less smoky than typical OMs made from rosewood. Here too are fundamental notes that leap off the strings and hold steady for a moment before diving quickly down into the swelling undertone, leaving behind a lofty stratosphere of harmonic overtones that extend the general sustain. At times it sounded quite similar to a hammer dulcimer with its immediate, popping report and ethereal sympathetics. And here, indeed, is heard a very good reproduction of the built-in OM compressor, as I call it. The personality of most acoustic guitars changes with harder playing, as the bass response increases and the instrument becomes throaty and then starts to roar. The old Martin OMs do not respond in this manner. They simply put out the same voice, only louder, as if someone is turning up the volume on a recording. The notes bark with a little more stridency, when played with vigor, but the balance and string to string separation remains pretty much the same. And I experienced that same response from this new OM-28 Authentic. Does it sound exactly like a prewar OM-28? Not to my ear. But it comes pretty darn close. If there were five of these new OMs and five prewar OM-28s played in a blind test for a group of guitarists, including vintage Martin owners, I doubt anyone would be able to pick out the new guitars 100% of the time. At any rate, for a guitar trying to replicate as closely as possible the construction of a $70,000 1931 OM-28, while keeping the street price well under $7,000, I am exceedingly happy with the outcome. For all their efforts to build this guitar just like a ‘30s OM, there are two things that are notably different from the original. One has a lot to do with why it does not sound exactly the same as the old timers, and the other helps make sure it sounds as close to the mark as it does. First, there is the elephant in the room. Rather, the elephant not in the room with this OM-28 Authentic 1931 is the Brazilian rosewood that it was not made with. Now an endangered species, legal supplies of Brazilian are so cost prohibitive that Martin makes most of its Authentics out of Madagascar rosewood. Almost as rare and just as exotic, Madagascar rosewood is deemed a close replacement for Brazilian in terms of visual beauty. And their tonal palettes often overlap, as examples of the darkest, warmest Madagascar share properties with the brightest, most effervescent Brazilian. But it has its own unique sound, which I find very much to my liking, offering pretty chimes of crystal clarity ringing over solid fundamentals that are chiseled with considerable definition, even if it lacks a bit of the woofy warmth Brazilian rosewood would have placed in the cellar. Like other Authentic models made with Madagascar rosewood, this guitar sports a back that was rift sawn to look as much like the old quartersawn Brazilian as possible. Of the two prototypes, this is not as aesthetically attractive as the one exhibited at the 2015 NAMM show, which has a back more typical of Authentic series Madagascar. But the sides on the example I played had absolutely straight grain that would require a more expert eye than mine to say if it was not quartersawn, or for that matter, Brazilian rosewood. The other major departure from older Martins is the use of torrefied spruce, meaning it was treated by extremely high heat and pressure, altering its molecular structure until it takes on properties of very old wood. And it changes the tone of brand new spruce soundboards in ways that make a guitar sound already broken-in right out of the box. To learn more about torrefaction and its use in luthiery, go HERE. Martin’s new Vintage Tone System (VTS) is a propriety version of torrefaction developed specifically for use in guitarmaking. A more-exclusive version of their VTS treatment is reserved for the Authentic series. And, along with this year’s OM-45 De Luxe Authentic 1930, the new OM-28 is the first model to be released with the new top. 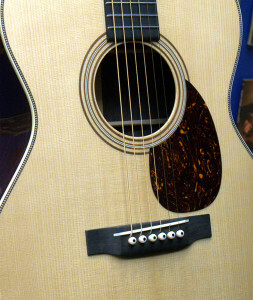 Torrefied spruce tops often take on the physicality of wood 200 or 300 years old. Martin has managed to zero-in their VTS treatment until the Adirondack spruce used on Authentics closely resembles that from Martins made in the first decades of the twentieth century, when viewed under the microscope. There is indeed an old-timey sound coming out of this guitar. That is due in part to the Authentic series construction techniques, but the torrefaction has at least something to do with it. A subtle vibrancy permeates the Adirondack ring thing, but is not as pronounced as I hear from typical torrefied spruce. More integrated and sewn throughout the voice, it becomes an organic part of the overall tonal soundscape, as it flickers near the edge of strummed chords, and trickles lightly across picking patterns. It is somehow linked to that dried out old box kind of quick reflection that seems to be rising out of the bones of the guitar. And no wonder; Martin has applied this same VTS treatment to all of the spruce bracing inside the instrument. So in a way, it is coming from the bones. But they didn’t stop there. This OM’s maple bridge plate received the VTS treatment too. How much all this torrefaction matters when it comes to physical energy turning into audible sound would be hard to quantify. I can only say it makes a noticeable difference, and in my opinion, very much for the better. Unfortunately, this particular guitar has an issue with its B string. Something was impinging it, so it could not ring freely or sustain as long as it should, and that inhibited the harmonic overtones quite a bit. It may have been the nut slot, or how the bridge pin was seated. I am confident other examples will have more in the way of harmonics igniting off the G, D, and high E string than are heard in my video sample. But it is an indication of the quality of this VTS top that it gets as much chime out of the high end as it does, even with a trapped B string. Oh and another thing! The notes that are traditionally most subdued on a new guitar simply aren’t. Even the “dead man’s note” at the 8th fret on the A string sounded as loud and resonant as the rest of the fretboard. It really is like the top has already broken-in. This does not mean the sound of the guitar will never change as it gets played. The hide glue and joinery are all spanking new, as is the finish. All of that stuff will go through changes as the guitar ages and settles in during years of vibration. But it has one heck of a head start, thanks to the “accelerated aging” of the soundboard, bracing, and bridge plate. Yes, the fastidious among us will find things about the construction of this Authentic edition that differ from a prewar OM, and they may feel it sounds a little different as well. But that is not necessarily to its determent. It is a wonderful thing to play such a vintage-like OM-28 without the intonation issues that plague old guitars. This new OM has perfect intonation all the way up the neck, rather than having it in tune for chords around the 9th fret or the 1st fret, but never both. And this drier, clearer Madagascar tone actually benefits the Authentics in general, as it creates a certain openness under the top voice that helps the sculpted fundamentals stand out all the more with considerable definition. It sounds vintage-like, even if it lacks some of the inky richness heard from other rosewood species. But when scrutinized as a vintage OM replica, what differences exist are picayune. The list of things Martin got right on the money is considerably longer. The OM-28 Authentic 1931 is based on one specific guitar, the 1931 OM-28 once owned by folk music icon Mike Seeger, now part of the collection owned by Fred Oster of Vintage Instruments, in Philadelphia, Pennsylvania. Martin took Seeger’s guitar, and subjected it to a painstaking inspection that included X-ray and CT scan imaging, to plumb its most intimate details. The bracing pattern on Authentic series OMs is laid out in the most historically accurate positioning possible, and like the original OMs, this guitar has slender, 1/4″ tone bars surrounding a main X-brace that is 5/16″ in width. The small maple bridge plate is tucked under the X-brace, a feature currently available from Martin only on guitars in the Authentic series. Tucked bridge plates help transfer subtle changes in vibration to and from the X-brace, which disseminates tone-producing energy across the soundboard. 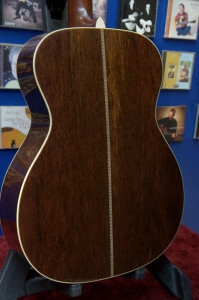 The specific shaping of the scallops and tapers carved into the braces are unique to this guitar and based on Seeger’s prewar OM. The bridge plate is likewise shaped to mimic the original, down to every noticeable detail. 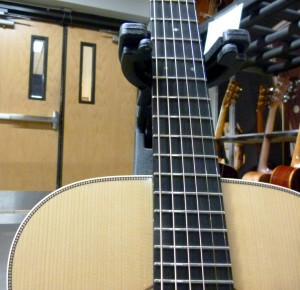 And all Authentic series bridges are shaped thinner like vintage Martin bridges, making them more sensitive to string energy and the guitarist’s technique. 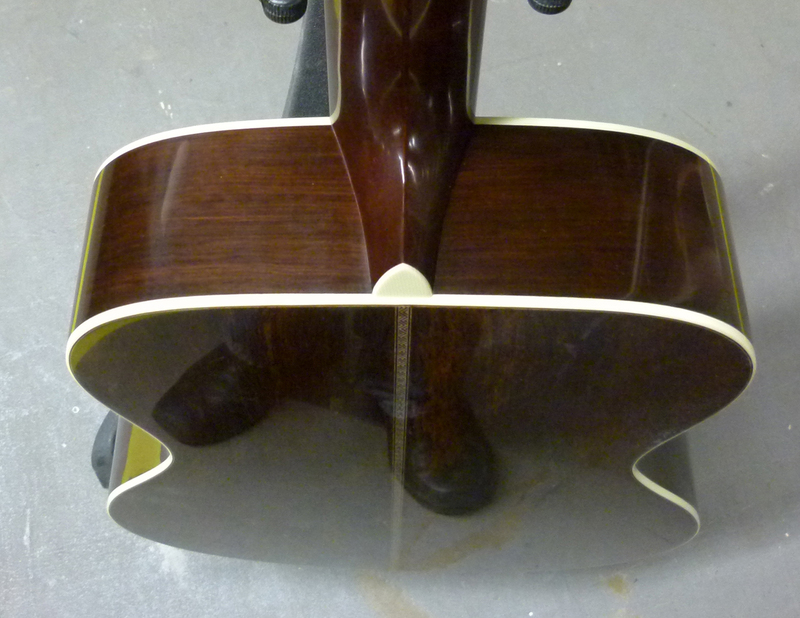 A feature likely to please many fans of vintage Martins is the carving of the neck. It is a successful approximation of a prewar OM neck from the earlier production runs – comfortable, practical, and versatile. They captured details from Seeger’s 1931 OM neck, which has a shallower profile than most 1930s Martins and a V that is not as pronounced or as pointy as that found on other vintage OMs, and which decreases as it extends away from the body, until there was just a touch of it remaining in the first position. This Authentic neck is subtly different from the original, however, mainly in how it is more perfectly symmetrical from cheek to cheek, and in how flawlessly it decreases in thickness as the fretting hand slides from the body to the headstock. While I might have preferred the slightly off-center, handmade feel of the original, this neck should please a wide range of players. To go along with the traditional 1-3/4″ neck is the string spacing of 2-5/16″, which should offer a similarly broad appeal, even if that measurement raises a few eyebrows. Prewar OMs are officially spec’d with a wider string spacing of 2-3/8″. He went on to say that Seeger’s guitar could be the result of just such a customer request for an OM-28 with that change, or even a dealer request for a batch of them. There is no physical evidence of an aftermarket change in string spacing. 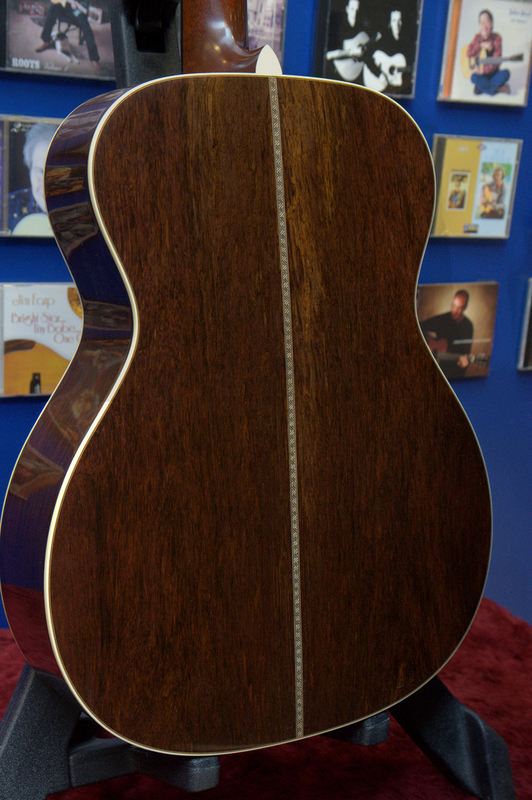 One thing is certain about the neck on Seeger’s guitar, like all original OMs, it houses a support rod made of solid ebony. And so too does this reproduction. Also, both were built without the flat “popsicle brace” that appeared under the upper bout of 14-fret Martins in the mid-1930s. Those two features help the OM-28 Authentic feel and play with as much vintage Martin mojo as it does. But the feature that makes it look most like a prewar OM-28 is the new historically accurate finish. Recently discovered correspondence from the period proved once and for all that Martin guitars built in Style 28 and below were finished with a level of gloss different from that seen on the fancy pearl-trimmed models at the top of the line. Not only that, the documents go into detail about how the specific finish was achieved. Starting with the OM-28 Authentic 1931, all Authentic series Martins made in Style 18 and 28 are getting this new historically accurate finish. Approximately 20% less reflective, the new finish provides more of a glow, rather than the mirrored candy apple shine people are used to seeing on modern-day Martins. But this is not a satin finish, even if it does make the neck silky smooth and oh so fast. There is a certain patina-like luster to it, without the discoloration that can appear on vintage instruments. In fact, Martin has done away with the yellowing toner previously applied to the body and binding of Authentic series guitars. They have also ceased the use of aging toner on the tops, as the new VTS tops already resemble older spruce. To learn more about Martin’s Vintage Gloss Finish, read excerpts from my conversation with Tim Teel, Head of Instrument Design, and Wood Sourcing Specialist Michael Dickinson, which may be found HERE. I wish I could have spent more time with the OM-28 Authentic 1931. I was just getting a feel for where and how it liked to be played, when I had to move on to other new Martins. But I sure liked playing it. Wishful thinking aside, it really is what people have been waiting for: as close to an exact reproduction of a prewar OM-28 as possible, made in a manner only C.F. Martin & Co. could achieve with all their insider information and know how. No, I cannot say it sounds exactly like an 84 year old Martin. Yes, it would have been even more authentic with Brazilian rosewood. But that would have removed from the general population of guitarists the opportunity to own such a close reproduction of a prewar OM-28, made very much like they did way back when. Despite small production numbers, the original OMs remained extremely popular, particularly with masters of blues, ragtime, and modern fingerstyle playing. They are now among the most coveted guitars ever made. Beginning in the late ’60s, various attempts to resurrect the Orchestra Model design have met with varying success, and many wonderful OMs appeared as a result. But none of the modern Martin OMs have been as much like the originals as their new Authentics. It has been ten years since the folks at Martin launched the Authentic series of exacting reproductions of renowned vintage Martins. So it is fair to say they have taken their sweet time in getting around to the OM-28 reproduction. For some, it may be nearly impossible for this new model to live up to the wishful expectations that have awaited its release. But a few minutes with this OM should convince most anyone that it is an excellent new guitar, no matter how it compares to an old one. Of all the fine Authentic series models, this one has my personal interest as a future purchase, more than any other. I have played many Madagascar rosewood OMs and none of them are remotely as vintage-like as this OM-28 Authentic. I currently own two Madagascar rosewood Martins made in the Custom Shop with Adirondack spruce tops. 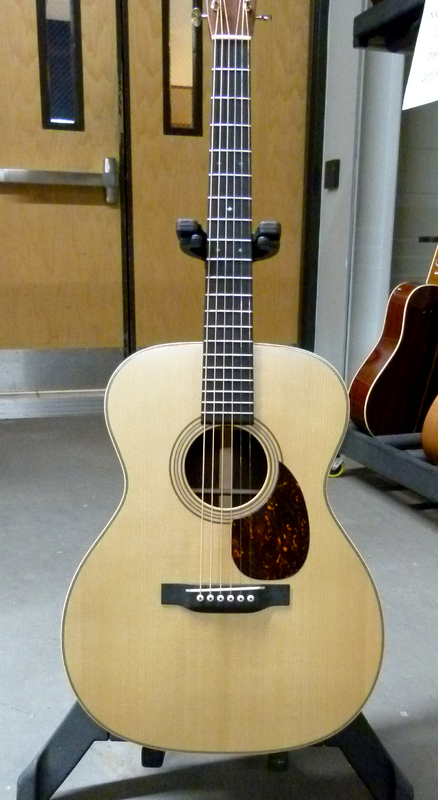 One is a short-scale 000 with Golden Era series construction and 1/4″ OM bracing. The other has the same construction of the Standard series OM-42, with the addition of a deeper body. When it comes to traditional OMs, I own a Laurence Juber model in Brazilian rosewood, and have owned an OM-28VR, a Brazilian rosewood Schoenberg Soloist made by Dana Bourgeois and TJ Thompson, along with a Collings OM and another Bourgeois OM, and I have played vintage OM replicas by Franklin, Merrill, Borges, Dudenbostel, TJ Thompson, Kim Walker, Wayne Henderson and others. Few of those guitars provided the same level of prewar OM feel and playability that I found in this new OM-28 Authentic 1931. Those that came closest had their own facets that were not exactly like a prewar OM-28. When this one sounded less like an old OM, I still very much liked what I heard. And there were times when it simply felt exactly like playing a prewar OM – even if that therefore comes with some of the limitations of a vintage OM. Some guitarists may not like that built-in compressor effect when they want to kick out the jams. Instead, they might prefer the roar and rumble of the lions and tigers and burly bear OMs found among Martin’s other series. This lightly-built Authentic series reproduction has a more open undertone, with less presence and more reflection. It gives off a drier, thinner sound than most Martin OMs, even if the trebles are not as gossamer thin as those heard from a prewar OM. But that barky, reflective wooden box sound that fills the room at the slightest touch, and remains at all levels of attack is exactly what sets this new model apart in a very vintage way. And for me, that provides a significant share of its overall wow factor. Even if it does not have the exact same voice and tonal coloring of a Brazilian rosewood OM-28 from the 1930s, it offers a pleasing likeness, and one had for a very reasonable price. There is an awful lot to love in this vintage-esque guitar, so light of weight yet so big on value, and so lovely to behold and to be heard. List price: $8,599. 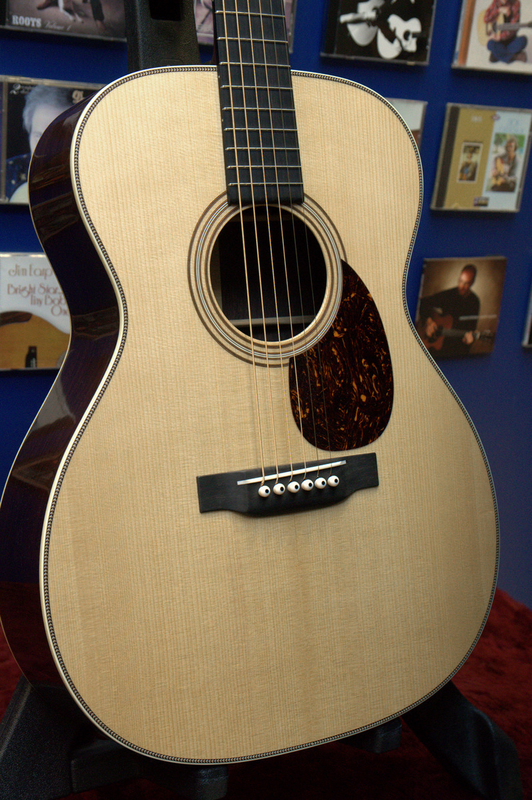 Ask your Martin dealer for the real price. Thank you for your query, Jim. Traditional Martin action is normally higher than their modern action set by the robotic Plec machine, which many find too low for anything like vigorous playing up the neck. Action can be a matter of preference. You should have it accurately measured for each E string. If your measurements are outside of this, i.e. “if it is out of spec” you should notify Martin Customer Service. You should be able to get that taken care of under your warranty. With a guitar with a non-adjustable rod that may mean a neck reset. But it is likely within spec, in which case you would have to take on the responsibly to have the saddle taken down further to reach action you like. I do not know if that impacts the warranty. Thanks Spoon for you feedback. I measured an am within specs 7/64 and 5/64. So I am at the maximum. I think I can live with that for now. Thanks again! Over the last four years, I’ve enjoyed hearing my guitars voice improve in complexity and character. It is without doubt the best auditorium guitar that I’ve heard. Last week, I fitted a set of Martin’s new titanium core strings to it , and was absolutely blown away with the improvement in tone. It seems incredible that a set of strings could make that much difference. Very expensive, but well worth it. I purchased an OM-28 Authentic 1931 just over a week ago and I’m really happy. I have other nice guitars like Brazilian/adi Collings and this guitar is right there with other handmade guitars. I actually played a 1933 OM-28 next to the Authentic and this Authentic was not blown away by the real thing. I’m not a “martin guy” and I would like to say that vintage OM sounded much brighter than I expected. It didn’t have the dark thump I usually hear from a Martin. It wasn’t bad bright but there was a lot of treble. Honestly, it sounded more like my brazilian Collings than a Martin. Frankly, I think this was due to the Brazilian and age of the wood. Brazilian sounds “glassy” to me and it had that bright glassy sound. One thing was that vintage OM was as LIGHT AS A FEATHER like it was going to float away. It was also very resonate and essentially buzzed in my hands with high frequencies as you played it. In the end, I purchased the OM-28 Authentic not because it felt and sounded similar to the real thing (it does and doesn’t just like the review says) but because the guitar is just wonderful sounding and plays like a dream. The neck is wide but not uncomfortable, but I have to stretch more. I can say the guitar changes in sound almost every 2 days or so if I play it and it just keeps sounding better. I am a total believer in the VTS top. It doesn’t look or sound torrefied to me. I’ve played Huss and Dalton, Bourgeois, etc. with torrefied tops and didn’t like them. They sounded thin to me. This doesn’t and it doesn’t look dark in color or have a faint burnt smell, which I’ve come across before. I would agree it is dry sounding but not in a bad way. The dry sound I would say is crisp and rich sounding at the same time. It’s not sterile dry. My only complaint is the bridge pins. Plastic! A 6K guitar with plastic??? At the same time, I just have to admit it does sounds good with the plastic pins. If you had told me they were FWI or something, then I would have believed you. However, I noticed these pins were bending right where the string hits them. I called martin and they sent me a new set. They told me they used this plastic because it is softer than bone and similar to the actual vintage pins, which I think were ivory. Funny enough, I swapped them out for some Bob Colosi (http://www.guitarsaddles.com) bone pins for Authentics (fit perfectly BTW) and boom! Now it actually sounds even closer to the vintage OM I played. It has picked up a brighter and “glassier” sound and definitely increased sustain. It even buzzes in my hands similar to how that vintage OM did. This guitar really responds to different pin material. I put in some ebony pins (not the right fit but could still hear a big difference) and it got a rich warm resonance to it. I’d like to have some ebony pins as an option but can’t find any that fit and I’m not altering the guitar. I’ve got some Mammoth Ivory on order now so can’t wait to hear how the guitar takes them. Right now, I’m using Bone pins with Martin SP flexible core lights and it’s awesome. Funny, the bone pins were too bright and then I played it for a day, and it mellowed out. I might end up liking the bone the best. However, I’m really curious to see how the guitar will change again with the Mammoth Ivory, which I understand to be softer than bone potentially rounding out the high trebles. Thank you, Patrick! And welcome to One Man’s Guitar comments. Martin uses plastic pins on Authentic Series guitars that had plastic pins in the 1930s. Plastics were considered exotic and expensive materials back then. They were especially valuable because they are inert. Martin used plastic pins because they do not shrink or expand with the changing weather or plunging cold, etc. That is the same reason they use them today; there is no risk of plastic bridge pins swelling and splitting a bridge if the guitar is subjected to sudden intense cold or extreme humidity the way wooden pins can. I find ebony pins are good for overly-bright guitars. And I find bone ideal for darker sounding instruments, like most rosewood guitars, because of the extra definition. FMI saddles can smooth off the brittle edge of brand new Adirondack tops and add some warmth, while losing some high sparkle. But pins should have less of an influence than a bridge, but they will certainly have some influence. With your top being torrefied, it already has given up most of that crispness you get with brand new Adi. However, my experience tells me the torrefied tops still evolve tonally. Even if the inner cellular structure is dried out, all that dried out stuff is still going to change as it vibrates over and over and over. Congratulations on your new Authentic! They are indeed grand guitars. OK, that makes sense why they are using plastic pins. I admit, they sound good but it did seem odd to me. Now I know. I will say, the bone pins just keep sounding better and better. The brightness is gone and now it’s just very crisp and transparent sounding with more sustain. I think either the top, pins or both settled in after playing over the past several days. Still amazing to me how fast it changes, again it seems all for the better. Love the guitar and i really liked your write up on it. I will let you know have the FMI pins go. I purchased one of these in April 2016. It is really a guitar of choice among others I have in the stable (converted armoire guitar cabinet) and after a year of playing it still really impresses and I am still working on its nuances. I did put a K and K in the instrument after about 6 months and not dissappointed with that decision. Only one down side is the hide glue does not do really well in holding the ivoroid binding in place whcich according to comments on other authentic this is not unusual. Otherwise this instrument perfect for a vintage replica in an affordable price range. I re-read the description and details above. As usual Spoon hits a home run in his description. Are you saying you have experienced loose binding on your OM-28A? If so how have dealt with that? And where do you live? I know that loose binding is an issue for many guitars in arid places like AZ and NM, regardless of the glue. Spoon, I need some advice. What should I do with all my other fine guitars now that you talked me into getting an OM-28A? My 28A is everything you so eloquently describe but I have to add my own adjective: Inspiring. Whenever I play one of my other guitars I’m inspired to switch back to the 28A. When I pick up the 28A I’m inspired to play and play and…you get the idea. If Messieurs is pleased, I am pleased. Thanks! I’ll do that. Still waiting… Arghh. Should be by Thursday. When you get your OM Gregory put some D’Addario EXP phosphor bronze strings on. They really open up the tone. Just ordered one from my favorite “know it all” guitar supplier. Dave, at California Vintage Guitars, sight unheard!!! Can’t wait til it gets here next week. Bought two D-28 1937’s from Dave last year and they are killer. Boooming, full range, but subtle when needed. I CAN’T WAIT! Good news indeed Mr. Friend. I hope you love the OM as much! Even at that fabulous price, it would cost me over AU$ 15000 to get one. My wife and kids would kill me! That is $9,000 street price, if you know where to look. Yes, that is a lot more than 000-42 from the Standard Series. But if you tried to order a custom shop instrument with all the specs of the Authentic Series guitar, which you actually can’t, it would cost a lot more. But I agree that the pricing on many Authentics is a bit much. Martin seems to base their list pricing on 1/3″ the cost of the actual vintage Martin the Authentic version is based on. Example: The 1930 OM-45 Deluxe was purchased by the factory for $300,000 therefore the Authentic version is $100,000. But once you lose the Brazilian rosewood and get into Madagascar rosewood, it is a bit better than 1/3″, but not by much. And it is arguable that they are out of line by comparing their Authentics to the very limited availability and craftsmanship from the 1930s to their current offerings. BUT it is also arguable that no one on earth has ever made a replica of a vintage Martins accurately as the Authentics, and that they are certainly worth more than many other modern acoustic guitars. I have had my guitar for over a year now, and it has really opened up more than I thought it would considering the torrefication. The tone has developed greater sparkle and clarity, and it sustains longer. What has surprised me the most though, is the evenness across the strings and the depth of tone when played with a pick, even strummed vigorously, and it is better at keeping a controlled tone. It doesn’t lose clarity as much as my D28 1931 authentic when played hard, and the volume is unexpectedly similar. Martin have created a masterpiece.I always knew it was a fabulous guitar, and it just gets better and better. That is so very nice to hear, Mike! I know it was a bit of a question mark, having to order it all the way from Australia. And it makes me all the more tempted to get one myself. I bought mine today and could not be more excited. Not a Martin guy. Have preferred Collings and Bourgeois, but man-oh-man!!! Game changer. Thanks for the good news, Philip, and welcome to One Man’s Guitar! And congratulations! I got to play three of them this week, side by side. Game changers indeed. That is wonderful news, Mike! Tonal Palette. Not pallet, not palate. One man’s flavor is another man’s color. Palette refers to a collection of colors, like on a New England hillside in autumn. Palate refers to a collection of flavors, like the complex interwoven scents and tastes experienced in a particular wine. But both have been used to refer to the thing an artist dips his brush on, since you could be talking about the plate the paint sits on, or the colors of the various paints on that plate. Since I am prone to using metaphors related to color and to other senses like smell and taste, I decided to go with the flavor map version, because to me the sound of a guitar is more integrated and complex, like a good single malt scotch, or a gourmet meal. And it is shorter and easier to spell in a hurry than the color map version. And pallet refers to a platform one would stack bags of fertilizer on.